At least 11 people were wounded when gunmen set off explosions and stormed government ministries in Somalia’s capital Saturday in an attack claimed by the Al-Shabaab Islamist group, police said. "There can be others inside but we have so far collected eleven people wounded in the attack," said Abdukadir Abdirahman Adan, director of the Aamin ambulance service in the capital Mogadishu. Police say the assault began when two explosions were set off near the ministries of public works and labour. Gunmen entered the buildings following the blasts. 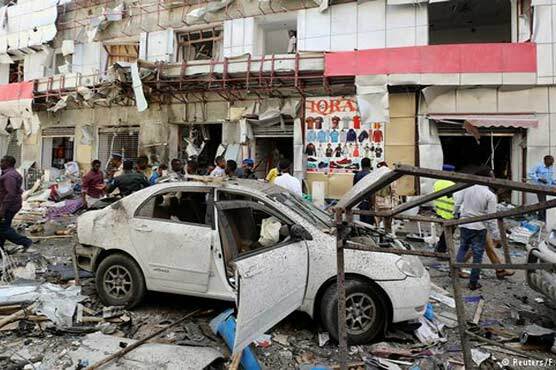 "The security forces rescued many of the staff from the buildings and they are still engaging some gunmen who managed to enter the building after the blast," said security commander Ahmed Adan. It remained unclear if there were any deaths in the attack. The attack was claimed by the Al-Shabaab Islamist group, which is fighting an armed insurrection in Somalia against what it sees as heretic and foreign influence. Police say the assault began when two explosions were set off near the ministries of public works and labour.